RAPAPORT... A slew of heists rocked the jewelry industry in 2018, making headlines worldwide. Rapaport News looks back at four of the biggest thefts of last year — and one of the tiniest. In August, thieves stole priceless royal artifacts belonging to former Swedish monarchs Karl IX and Kristina. The robbers took the items from a display case during a raid on the Strängnäs Cathedral, before escaping in a speedboat. The stolen items, which include two crowns and a golden orb adorned with a crucifix, date back to the early 17th century, and were part of the king and queen’s funeral regalia. The criminals have yet to be located. The November swiping of the diamond-laden Portland Tiara created for Winifred, the duchess of Portland, to wear to the 1902 coronation of King Edward VII was only the latest in a string of royal thefts in 2018. Security at the Portland Collection gallery in Nottinghamshire, England, missed the thieves by 90 seconds. 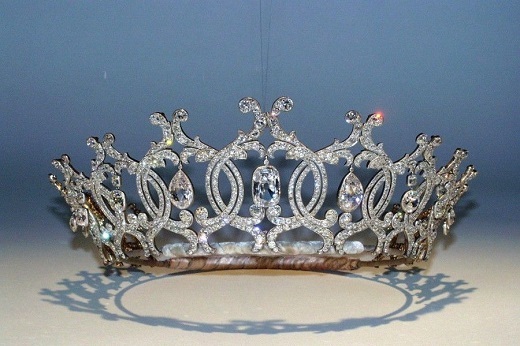 Neither the tiara nor the perpetrators have been found. Five men were arrested in Croatia for seizing approximately $2.2 million worth of jewelry owned by a member of the Qatari royal family. The January heist happened on the final day of an exhibition, “Treasures of the Mughals and the Maharajahs,” at Doge’s Palace in Venice, Italy. While the jewels have not yet been recovered, one of the suspects is believed to be a member of the Pink Panthers, an international network of jewelry thieves. In January, five men armed with guns and axes burst into the Paris Ritz, smashed display cases in the hotel’s jewelry shop, and stole approximately $5.2 million worth of jewels. Three of the thieves were stuck inside when the security system automatically locked the doors, but one managed to throw the bag of jewels out of the window to an accomplice waiting on a scooter. The trapped men were taken into custody. While all the jewels have since been recovered, two of the suspects are still at large. In August, a criminal pulled off a daring caper in broad daylight, and in plain sight. The culprit stole more than its own weight in diamonds, dragging it along in an attempt at a quick getaway. The perpetrator was a greedy New York ant captured on video by the dealer it stole from, as it made its way across a desk with its prize (see video below). Authorities have not released any details on sentencing or how much time the insect will serve.